The last couple of months have been extremely busy with getting rid of or selling a lot of my stuff, and planning a cross-country move. 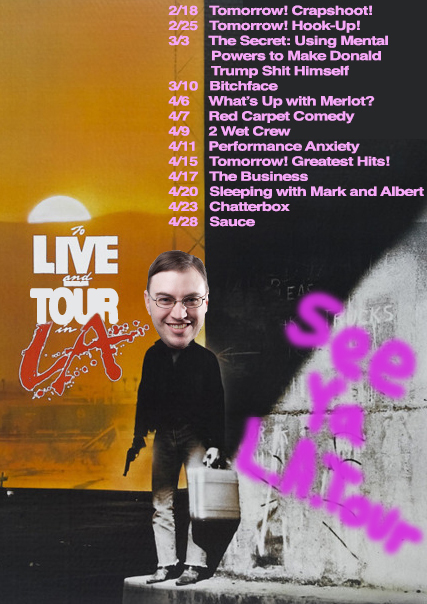 And so it wasn't until today that I was able to finally put together a flyer for my now completed See Ya L.A.Tour! Please pretend I have been using this all along. Also, MANY thanks to everyone who helped me along the way of this monumental single-city tour of my former home, Los Angeles! Thank you to Ron Lynch, Zach Broussard, Rachel Mac, Samantha Ross, Theresa Bateman, Margo Buzz Ness, Anna Hossnieh (even though that show was cancelled), Jay Weingarten, Eli Olsberg, Sam Varela, Megan Koester, Chris Garcia, Sean Keane, Mark Alexzandr, Albert Huber, Steve Hernandez, Scott Luhrs, Ellie McElvain, Erin Lampart, Brodie Reed, Barbara Gray, and Jeff Wattenhofer!!! A special thank you to Andy Kindler for saying he really liked my set, and then basically taking it back when he found out I wasn't being sarcastic about loving Mindy Kaling. You are all the best! The last thing I would like to say is that on the plane ride to New York, I watched the film Collateral Beauty, and I really liked it. Weird movie!